This utility has been designed for speech recognition users who use voice macros to switch between open applications and tray icons. It works on Windows 7, Windows 8, and Windows 10 operating systems, both 32-bit and 64-bit. For example, speech recognition users that use Dragon NaturallySpeaking Professional with the third-party provided Utter Command add-on can switch to the third application shown in the taskbar by using the command “Window 3”, or can right-click on the third visible tray icon by using the command “Tray 3”. When there are many open applications, or when the user has a significant amount of tray icons, it can become quite cumbersome to count by hand the number of icons in order to identify the sequence of the intended application or tray icon. – the icons for the open and close-but-pinned windows applications. – all the visible tray icons. and then placing tiny visible numbers (a.k.a. “hints”) in the top left corner of the application icons, and in the top right corner of the tray icons. The numbering scheme supports more than one digit, so that the hint for the 12th application is “12”. While this utility has been tested with the Utter Command user interface, it will work with any other voice macros that select open applications or tray icons by rotating with them sequentially from left to right. The utility adjusts dynamically as new applications or tray icons are added, and also works when the user has chosen to make just a subset of the tray icons visible. This above “Speech recognition” section wasn’t written by me. The author wished to remain anonymous. You can use the Windows key+number keyboard shortcut to refer to a taskbar item. 7+ Taskbar Numberer adds numbers to your taskbar items, so you can see right away what keyboard shortcut is assigned to each item. Optionally, the numbers can appear only when the Windows key is down. Optionally, you can use this option, but show Win+# keyboard shortcuts when the Windows key is down. You might also want to add the -hidetray command line switch to hide the tray icon. -v1, -v2, -v3, -v4, or -v5. To exit from this utility, right-click the tray icon. Posted in Releases, Software by RaMMicHaeL at July 22nd, 2012. I liked the App a lot but unfortunately it does not work on the newest Windows 10 x64 version. When you start it, it displays error messages every second “IDS_INJERROR_X3” which keeps popping up every second until you force close in Task manager. Then you have to restart explorer as the start menu stops working. For now I disabled it, but would be great if you can fix this. It happens on Windows 10 Build 10586 called Windows 10 1511 Version which came via Windows Update yesterday. Here’s a screenshot of what happens. Windows 10 builds newer than 10240 are not supported at this time. I noticed the same thing after applying the latest updates. If the numberer was enabled at startup, explorer would rapidly crash and restart infinitely. Eventually discovered that this app was the culprit. Hope it can be updated, as I found it quite useful! Any chance this could go on Chocolatey.org, like the Taskbar Tweaker app (or could these features be rolled into that app)? I’m not the maintainer of the 7+ Taskbar Tweaker package. In fact, I’m not really familiar with Chocolatey. You might want to try asking the maintainer of the 7+ Taskbar Tweaker package about adding a package for 7+ Taskbar Numberer, too. Will it let me use WIN + NUMPADKEY to switch windows? No. The only thing the tool does is displaying the labels. Hotkeys are not affected. VirusTotal doesn’t show a detection. Please contact Avira with the exact details of what you’re seeing. Just leaving a comment to say how useful this program is. I’ve never understood why Microsoft didn’t add a number-utility when they added the winkey+number launch function. Also kudos on the color tool! I spent a while trying to regedit colors in myself but got stumped due to the UseNewAutoColorAccentAlgorithm. 7+ Taskbar Numberer should support builds 10240 and 10586 of Windows 10. I’m running Windows 8.1 Pro 64bit, and am getting an IDS_INJERROR_LOADDLL error and no numbers on the taskbar. I loved this application when I was using Windows 7 SP1 and I miss it. (With the 32bit version I get the IDS_ERROR_64OS, implying that the 32bit does not run due to the fact that I am running a 64bit OS). Update: I’m running DisplayFusion – I turned that off and although I stopped getting the INJERRORs, the numbers still weren’t showing up (and the 2013 version still crashed explorer). Might an early release from the Windows 8.1 update fix this if you have older versions available? Do you have any other customization tools in addition to DisplayFusion? Are you using a custom theme? 7+ Taskbar Numberer doesn’t support the classic theme on Windows 7, but as far as I know, the classic theme is not available in newer Windows versions. Also, what is your exact Windows version number (including build number)? I have checked it on Windows 8.1 with all of the updates installed, and it worked as expected for me. I looked at it again, and I think that I have found the issue. Please try v8.4, and let me know whether it works for you. Sorry I didn’t get back to you sooner, I missed the email notification and I then forgot 7+TbN as it’s something I tend to install and forget. I can confirm that it was working fine until I installed DisplayFusion which does do some tweaks to the taskbar. The only other thing is with all the versions of 7+TbN I have downloaded, the only way to tell them apart is the date metadata, so could I request (a) in future versions to include a version number somewhere in the Zip, whether it be the filename of the Zip or the EXE, and (b) an old versions download page (with dates), mainly so I can organise the different 7+TbN versions I have? 🙂 . Oh, and one more thing, for the command line (which I set up at startup using Task Scheduler), I can only get the EXE to actually start when I change the filename of “7+ Taskbar Numberer.exe” to include no spaces, as putting “quatation” marks around the EXE does not appear to work. I don’t plan to publish old versions. The goal is to have the latest version to work the best. I’ll look at adding version info to the properties of the program. Cool app! But Infected or not? This is a false positive report. Feel free to contact the two companies and ask them about it. Thanks for this beautiful little tool! Any chance of creating numbered overlays like these for the desktop, Internet browsers etc.? Sir, the latest updates to Windows 8.1 break 7+TN. If you can update it, I will be grateful. I have installed all of the updates on my copy of Windows 8.1, and everything works for me. Can you navigate to the Windows folder, and check your explorer.exe file version? Also, are you using a 64-bit system? Explorer.exe is at version 6.3.9600.18231. I am using Windows 8.1 64-bit. Is there any other troubleshooting I can do or a crash dump? On my Windows 8.1 64-bit test PC, I have explorer.exe of the version 6.3.9600.18231, and the tweaker works without problems. Can you send me the following files from your system? Uploaded here: https://www.sendspace.com/file/n1211d This is the error I get when I run 7+TN: http://i.imgur.com/Boj5HnH.png 7+TT works fine without any issues. I am also running Classic Shell. OS is Windows 8.1 Pro with all updates applied, 64-bit OEM. Thanks, I’ll check that. But in the meantime, can you verify that you’re using the latest version, 8.4? Yes, running the latest version of 7+TN. I can’t see its version once downloaded as unlike 7+TN, the EXE doesn’t have Version Info but I downloaded the latest one right now from the website and it gives me this error on Windows 8.1 with all updates applied. Good point, I’ll consider adding a version info. The thing is, I can’t reproduce the issue on my PC, and a similar issue was fixed in an earlier version, so I want to make sure that you’re using v8.4 before investigating further. Well I had removed 7+TN from startup for a while since it was crashing. I replaced the file on my PC with the one linked above. Both files had latest date of 17 Feb, 2016. But somehow now the error has disappeared. Thank you! How strange is that. I am 100% sure I had the latest version since the dates are same but now there is no error and it works as if nothing ever went wrong? Anyway if I get it again, I will let you know. 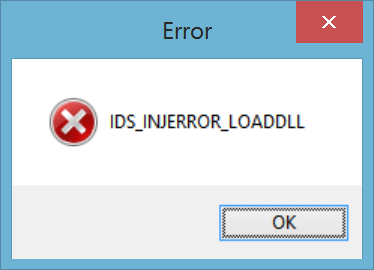 Just FYI, I’m getting an IDS_INJERROR_LOADDLL message when I try to install this (Version 8.4, downloaded from the Dropbox link) on Windows 10 Preview Build 14352. I understand if functionality with preview builds is not a priority, but just thought you might like to know in case it helps you plan for compatibility with future releases. I only just discovered that Taskbar Numberer existed, so I don’t know whether it would have worked for me on a previous build or not. Thanks for sharing this tool, in any case. Seems very useful and I’d love to try it someday. Thank you very much for your great tools ! Your taskbar-numberer only works with Aero-Designs. In aero the numbers are not good readable on my CRT-monitor. Short question: why key ‘-v4’ and ‘-v5’ are not documented. And thank you again for the tool! The reason is that the tool wasn’t originally designed for that, and while I was OK with quickly adding the options as new command line flags, I was reluctant to tweak the GUI or to re-word the description. The Windows 10 Anniversary Update will be upon us very soon. Will this lovely tool continue to work? I know it’s a real pain but please, please make it work in the latest version of the OS too. I use these undocumented switches too! I plan to add support for Windows 10 Anniversary Update after I complete adding support for 7+ Taskbar Tweaker. Stay tuned. 7+TN 8.5 works brilliantly on Windows 10 1607. Thank you so much for continuing to update it and adding a version number!! I just discovered the hidden -v4 and -v5 switches. They are amazing – now the grouping of buttons is somewhat useful since the user has an idea how many items are grouped. It is just as useful as 7+TT. You are a great coder. Running Windows 10 Pro, anniversary update, version 1607, build 14393.10, and I’m getting an IDS_INJERROR_LOADDLL error. I haven’t tried a clean boot but it was working fine before the update… I can do some further testing tomorrow around 20:00 BST… Are you aware of errors in the anniversary update? I’ve released v8.5 yesterday, which should work with the anniversary update. Have you tried it? Since 20161111, there has been an update for win10. Since then, this app mysteriously stopped working. In-fact I can only get the app to launch- IF- I “Run as Admin…”. But again, this 7plustaskbarnumberer is no longer working since this update. It would be awesome if this was a feature along w/ taskbartweaker. It would make more sense. This app doesn’t even have an update option so it’s a lot harder to end up using. Are you using an insider build of Windows 10? What do you mean by “not working”? Are you seeing any error message? It should work with the latest non-insider build of Windows 10. Oh man, I see what’s wrong w/ my post (I forgot to mention the detail of the problem). But actually I just needed a 2nd restart (after updating) to clear this issue — so now it’s solved. But, the problem in the first place was that the numbers wouldn’t show up & the app would only run if chosen to “Run As Admin…”. But now both of those issues have been solved after another reboot for re-assurance. One suggestions; it puts a “0” on the 10th icon and no number on 11th, 12th, etc. But Windows 7 allows you to press Win+10, Win+11, etc. Would it be possible to have it display numbers on 10, 11, 12, etc? Thanks for the suggestion, but how do you press Win+11? It just activates the first window two times for me. Perhaps I’m misunderstanding, or perhaps you’re using some extra software for this functionality. Interesting. I’m not sure which software would be doing it; maybe one of the drivers I have installed, but definitely nothing I purposefully installed for it. I’ll see if I can try to figure out which program/driver is doing it. Creator Update is released today, sadly found this nice utility won’t work after upgrade. Can you fix it? It works! Thank you for your work! sigh Another significant Windows Update, another version of 7+ Taskbar Numberer required. Creators Update appears to have broken this application like the Anniversary Update did last year. Do you have any versions newer than 8.5? Any ETA for this? I’m just asking to know if I should check this page for updates every day, or if you think we’ll have to wait some weeks or months. Likely weeks. Hopefully not months, but I can’t tell for sure. I’ll get to it when I have time. Please try version 9.0, it should be compatible with the Fall Creators Update. Please try the new version, 9.0. Do you think it’s posible to add support for the use of number keys in the number pad? I think it would be a way to duplicate the number of taskbar icons reached by your utility. Thanks for your excelent work. The Windows+# hotkeys are provided by Windows, not by 7+ Taskbar Numberer. It’s possible to add other/additional hotkeys, but the functionality has to be programmed. If you’re a programmer, you can make use of the 7+ Taskbar Tweaking Library. If not, I might consider doing it as a paid project. Email me if you’re interested. Discovered and enjoying 7+ numbered for last few weeks. Just updated Windows Fall Creators update. 7+ Numbered isnt showing numbers on the taskbar. Is their any compatibility issues? Just saying thanks for publishing AND maintaining the compatibility with the latest W10 versions. So thank you! The useful app seems to have some compatibility issue with my Windows 10 Insider Version 17074.rs_prerelease. When I start the exe, no error message is shown, and the config window pops out normally. However, all the icons on my teskbar immediately disappears, leaving only the Cortana and the Timeline button. When I exit the numberer, everything is back. I’ve already tried to run it as adminstrator or use compatibility settings of Windows 7 and Windows 8, but none of it works. Unfortunately, insider builds are not supported by 7+ Taskbar Numberer. Any plan to update it for Windows 10 1803? I plan to work on it once I’m done with updating 7+ Taskbar Tweaker. That’s great to know, thanks for the feedback. Works great again, thanks a lot for this Windows 10 version 1803 compatibility fix! Version 9.1 works fine with Windows 10 1803. Thanks a lot for the update! Donated and using – very very useful thanks ! The boxes and numbers seem to me unnecessarily big, can be made smaller (with smaller font) that will be very helpful ! to mine, it is too small. Maybe themes play a role? Working great on Windows 10 1803! Thank a lot for your great software that’s making everyone’s life easier! Awesome tool, thanks for writing and sharing it! Is there a way to have multimonitor support where the numbers will label button on all monitors instead of just the primary monitor? It already has multimonitor support – try the “Speech recognition software” option. In “Win+# hotkeys” mode, the numbers are deliberately displayed on the main monitor only, since the hotkeys only affect the main monitor taskbar. Almost perfect. 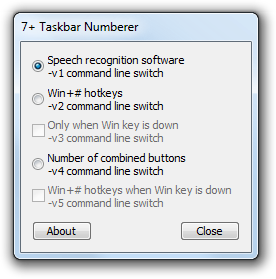 Any way to get it to not show numbers on the task tray when using the speech recognition software option? I’m using this in conjunction with speech recognition and as far as I know there are no keyboard shortcuts to activate the icons in the tray. I’m not sure how the speech recognition program works, but Win+B activates the notification area if that helps. Currently there’s no way to hide numbers on the notification area while using the speech recognition mode. Great software! I needed just this. Thank you! It broke with the latest Windows Update 1809: it seems that it’s making explorer.exe crash and restart every second: my taskbar icons and systray is continuously erased and displayed again. I plan to make 7+ Taskbar Numberer compatible with the Windows 10 October 2018 Update once I have the time to look at it. Thanks a lot for this new version! You can donate and use latest beta to get 1809 working. That’s correct for 7+ Taskbar Tweaker, but this page is about 7+ Taskbar Numberer. I was wondering, is there any way you can display the number badges next to the application icon (or at least, without hiding it that much)? No, that’s not possible at this time. Too bad. It looks fine on Windows 7, but on Windows 10 where the taskbar icons are smaller, I find it hides the icons too much. Well, you can get large icons on Windows 10 too, see here. Thanks for the hint, didn’t know that! First of all, this is very cool. Thanks for the development time and effort! Would you consider making an option for the tasktray icons to be accessible via keyboard shortcuts as well? It’s a shame to have them all number, and not able to be accessed quickly with a keystroke. You can use Win+B to set focus in the notification area. There’s shortcut to access them by numbers, but perhaps you’ll find that Win+B is good enough. Ah, one more suggestion for you. Being able to set the size or scalability of the numbers would be a REALLY nice feature, especially for the tasktray icons. Normally I have those icons on the smaller size (and I want to keep it that way), but the size of those numbers pretty much takes up 80% of the icon. It would be nice to have them in a corner, at a much smaller size. What do you mean? Tray icons have the size of 16×16 (like on the screenshot on the top of this page), and as far as I know, their size is not configurable. Here’s how the icons look on my screen (I’ll have to outsource a link here since I cannot attach images). See how big they are and block out the majority of each icon? If I could make the taskbar numbered buttons in this area smaller, say by at least 50%, it would be so much nicer. But I guess you cannot do that according to what you said. That’s possible, but smaller numbers will be obviously less readable. It looks find while there’s a single digit, and then becomes too large when a second digit appears. I wonder what’s your use for the numbers, since you don’t have a keyboard shortcut for it and you don’t use a speech recognition program. You are right about that, the two requests would have to go hand in hand, lol! I will still use the app for the regular taskbar though since those keyboard shortcuts work. Perhaps I will have to look into another app to get desired functionality if one even exists. Hmm, perhaps I’m doing something wrong then. I read your post and I was aware of Win+B, but it only works to quickly navigate by the first letter of the application name in the taskbar. I cannot get this to work with Win+B, then a number. Yes, Win+B only sets the focus on the first element. Then you can use the arrow buttons no navigate to the desired icon. That’s a shame, it would be awesome if I could just hit a keyboard shortcut to access all those numbered tasktray buttons down there (via specifying a number value + modifier). If there are 9 elements on the taskbar, a 10th or 11th elements will not have a number. Can any further element after the 9th marked up with letters? starting with a, b, c .. Probably a further hotkey combination would be needed for this, as some Win+Letter combinations have function. Since Windows 8 even more. Out of the three images, this is the only one that looks problematic. As far as I remember, the text color should be based on the theme, but I need to check the code to remember how it’s implemented. It can be done, but as you have said, Win+letter is problematic since many of those are used by Windows. Combination of Win+Alt+letter works. This won’t interfere with Win+letter Combinations. About the color issue: If you cannot control the color of the foreground, could you change the background color to white? It would be surly rich of contrast with black on white. Or any other fixed color contrast. Run it as admin to let it work for nearly any application. Does not work with Task manager for me. Works partly with taskbar/tray. Should be fixed in v9.4. Yes, I confirm! Thanks a lot. Hi, Sir, thanks for the great tool. v9.4, how can I change the font color and size? Win 10 with Classic Shell, I am able to change font size and color of the taskbar, but not the numbers on the apps. Thanks. Currently there’s no way to change the color and size of the badge. Hi! I’m having problem to download the zip file. Is the link ok? Yes, the zip download works for me. If you need, I can re-upload the file to a different storage for you. I am getting error 522 from Cloudflare. Can you send me via email? Here’s an alternative link. As for the server error, unfortunately it happens sometimes for some geographical locations. The proper solution would probably be to switch hosting, but I’m reluctant to do it for now. I’m access from Brazil. In the past I access with no error. I really find this useful but after Windows 10 update, im getting the “IDS_INJERROR_LOADDLL” error 🙁 No number is showing up on the taskbar. Should be fixed in version 9.5, please try it. Your application is being flagged by multiple security tools as malware. One thing that I’ve noticed will conducting an application review of this software is the lack of a Code Signing Certificate. I don’t know if that is the only reason why some endpoint protection tools are flagging it as malware, but I wanted to bring this to your attention. False positives are unfortunately common for new versions of 7+ Taskbar Numberer (and 7+ Taskbar Tweaker). Please see this blog post which explains the situation of false positives regarding small tools very well. You are right about the code signature – my tools don’t have one. I’m not sure if a signature would change the situation regarding false positive detections. Anyway, a certificate is not cheap and needs to be constantly renewed, and since my tools are simple and free I decided not to sign them.